Precious is a bright pink dog with a white muzzle and belly. 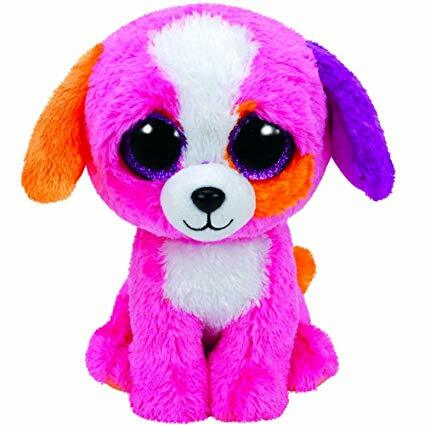 She has large, glittery purple button eyes with her eyelids in a sleepy expression and she has a black button nose. The bottom of Precious’ feet are orange and she has a purple left ear and an orange right ear. A patch of orange is around her left eye. The perfect pet for you, don’t you think! Precious was released in February 2016. Her Birthday is on 19th August. There are two versions of Precious. This small 6″ Beanie Boo and a medium 9″ Beanie Boo Buddy.